The following was submitted by Stephen Wyse, an attorney at law. Mr. Wyse is a regular contributor to CopBlock.org and submits whenever his cases are relevant. Our sincerest gratitude to Mr. Wyse and attorneys like him that are on the front lines of legaland fighting for truth and justice. CPD Deputy Chief Jill Schlude benefits from Prosecutorial Discretion exercised by Special Prosecutor Chris Wilson as he decides not to prosecute her for obstruction of justice. In addition, Special Prosecutor Chris Wilson extended that consideration to CPD staff that actively obstructed a federally authorized process-server employed by me. In a previous blog post, I discussed the filing the criminal and IA complaints against Deputy Chief Jill Schlude and against another CPD Officer for illegally wiretapping an attorney-client phone call. As a result of the first complaint CPD requested that Boone County Prosecutor Dan Knight appoint a special prosecutor for the Deputy Chief’s obstruction of justice investigation. At Prosecutor Knight’s request Callaway County Prosecutor Chris Wilson was appointed by the court as a Special Prosecutor to review Deputy Chief Jill Schlude’s obstruction of justice by avoiding a federal subpoena. See also the Columbia Tribune article by Alan Burdziak. Special Prosecutor Wilson’s “prosecutorial discretion” is an authority to decide what charges to bring and how to pursue each case. A prosecutor who declines to pursue a viable criminal case against a person has thereby exercised prosecutorial discretion. Missouri law provides: Definitions 575.010 for this chapter. The relevant provisions of law are within 575.160. 1. A person commits the offense of interference with legal process if, knowing another person is authorized by law to serve process, he or she interferes with or obstructs such person for the purpose of preventing such person from effecting the service of any process. 2. “Process” includes any writ, summons, subpoena, warrant other than an arrest warrant, or other process or order of a court. 1. An employer, or agent who is in charge of a business establishment, commits the offense of refusing to make an employee available for service of process if he or she knowingly refuses to assist any officer authorized by law to serve process who calls at such business establishment during the working hours of an employee for the purpose of serving process on such employee, by failing or refusing to make such employee available for service of process. In my legal opinion a federal subpoena duces tecum (to produce documents) at a deposition would be “ANY PROCESS . . . of a court” that my investigator was willfully prevented from serving. Missouri law respects the authority of both federal and state courts subjecting Deputy Chief Jill Schlude for prosecution for knowing avoiding a federal subpeona as she later admitted in her deposition. Thereby Deputy Chief Jill Schlude benefits from Prosecutorial Discretion despite the commands of Missouri law. In law enforcement there are many places that have developed an unhealthy symbiotic relationships between police and prosecutors. Sometimes in these relationships prosecutors may tacitly approve of criminal conduct engaged in by law enforcement. These type of relationships can be rather benign or they can be an appalling “Devil’s Bargains” where both sides conspire to keep the details of astonishing behavior secret and unknown to the public. As a young cop, I accepted the concept of “Professional Courtesy” whereby law enforcement had a de facto immunity from minor offenses, from speeding to drunk and disorderly conduct. Some police and/or prosecutors extended this immunity to felonies and intentionally malicious conduct by their brothers and sisters engaged in the law and order professions. In a normal civil rights case where the parties had generally acted in good-faith. I would have agreed that such discretion exercised by Special Prosecutor Wilson was reasonable to exercise when he gave Deputy Chief Jill Schlude benefits from Prosecutorial Discretion. However, in the case of Matt Akins of Citizens for Justice vs. the City of Columbia and Boone County Prosecutors, I do not agree that this discretion was reasonably exercised. In the instant matter, the Columbia Police Department was repeatedly and mysteriously plagued by several instances where video and/or audio recordings related to the Akins’ case were either not retained, deleted or mysteriously vanished without explanation. In addition, to computer logins that should have identified which Columbia Police Officer that accessed restricted police files to create a “Wanted Poster” inaccurately describing Matt Akins criminal arrests and and noting he was known to be armed and his association with Citizens For Justice targeting Matt Akins for retaliation for his reporting activities were “unavailable”. This mysteriously created police “Wanted Poster” using restricted law enforcement computer data, which required user logins to access, was somehow displayed in “police only” restricted access area of the CPD Briefing Room for months, yet no one at CPD knows for how long Akins’ “Wanted Poster” was displayed or who accessed information from restricted police files to create or who placed Akins’ “Wanted Poster” in this restricted area of CPD. My previous posts about the apparent selective reliability of CPD’s video recordings produced calls to my office regarding unrelated traffic accidents involving CPD Officers on-duty where video and audio recordings failed to be retained or were deleted in what must be described as curiously suspicious circumstances. In recent years the frequency in which police videos helpful to the accused or injured citizen have been deleted or not retained are reaching a frequency of occurrence that makes it seem like a policy decision by law enforcement to “vanish” videos in which their actions are not in keeping with CPD’s legal obligations. 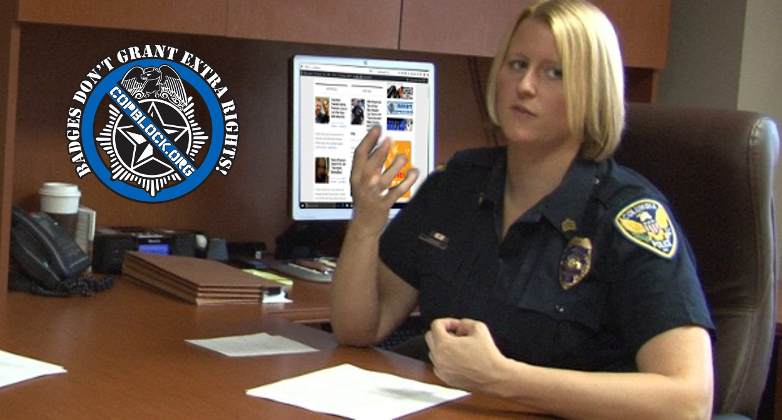 Deputy Chief Jill Schlude benefits from Prosecutorial Discretion and will avoid state criminal charges. The United States Attorney for the Western District of Missouri is reviewing the matter to determine if federal charges will be filed in these obstructing justice and/or the wiretapping matters. Recent guidance from United States Attorney General Jeff Sessions discouraging Justice Department action against police officers may have an impact on this consideration. Thereby permitting Deputy Chief Jill Schlude benefits from Prosecutorial Discretion on a federal level as well. Commitment to the principle that we are a nation of laws and that no one is above the law is being challenged here. This principle is sometimes contradicted by a reality that when the criminal conduct was committed by a law enforcement officer and the government may willingly become impotent in its response and so CPD Deputy Chief Jill Schlude benefits from Prosecutorial Discretion. ← Cop Block Founder Ademo Freeman Is Out of Jail After Major Bail Reduction!